A Youth Exchange is not a free holiday for young people. A Youth Exchange is a unique opportunity to learn about fellow young people living in different cultures and countries, a chance to develop new skills, to participate in a life changing experience and be involved in something different. 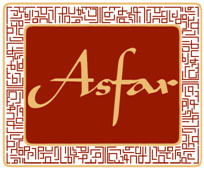 An Asfar Youth Exchange or Transnational, normally last between 6 to 8 days in a country either in the Middle East, or a country which has been significantly influenced by the region, whether this be through Faith, Culture, Language, Economically or Politically. For instance, through the wide ranging shadow of the Ottoman Empire, which at one point stretched from the gates of Vienna in Europe, to the Gulf, North Africa and even as far as the Caucasus, provides many host country options for Youth Exchanges. While the influence of Faiths that originated in the Middle East, such as the 4 key monotheism Faiths that have had a major effect on societies: Islam; Christianity; Zoroastrianism; and Judaism, extends these regions even further. An Asfar Youth Exchange, is a programme of activities in another country that mobilises informal learning tools to develop skills within young people, especially Employability, Enterprise and Life Skills. All Asfar Youth Exchanges, are designed to also help young people move forwards, whether this be towards employment; into education or an apprenticeships; or towards another destination. An Asfar’s Youth Exchange, also includes concepts such as: Citizenship, Social Responsibility, Youth Participation and Volunteering. For instance, young Volunteers will have the opportunity to get involved in an Asfar Youth Exchange in order to develop their youth work skills. In August 2014, Asfar received confirmation of its’ status as an official Erasmus+ programme managed by the British Council and Ecorys UK. Erasmus+ allows Asfar to offer our Contributors, Volunteers, Students, Graduates and wider Young People the opportunity to learn about the Middle East, its’ history, culture, diversity, languages, arts, geography, economics, and of course, its’ politics. However, like Asfar’s original objective, Erasmus+ will allow young people of all backgrounds, to understand the region first hand, beyond the study of International Relations, Media reports, War, Religion and Conflict. Asfar’s Erasmus+ programme, will assist Young People to understand the Middle East and to also learn that it is more than a region of conflict. Asfar’s Erasmus+ programmes also develop participants’ Skills, Citizenship, Cultural awareness and Work-readiness, and bring groups of young people together from diverse backgrounds, breaking down social, cultural and economic barriers.